Election and Re-election – At our January 2019 meeting the following were chosen to lead as your board members: Michael Cicinato – President, Peter Sternberg – Co-founder and Director, Michael Johnson – Treasurer and Legal Counsel, Daniel Jimenez – Secretary, Bill Reisz – Director, Warren Hoy – Director. 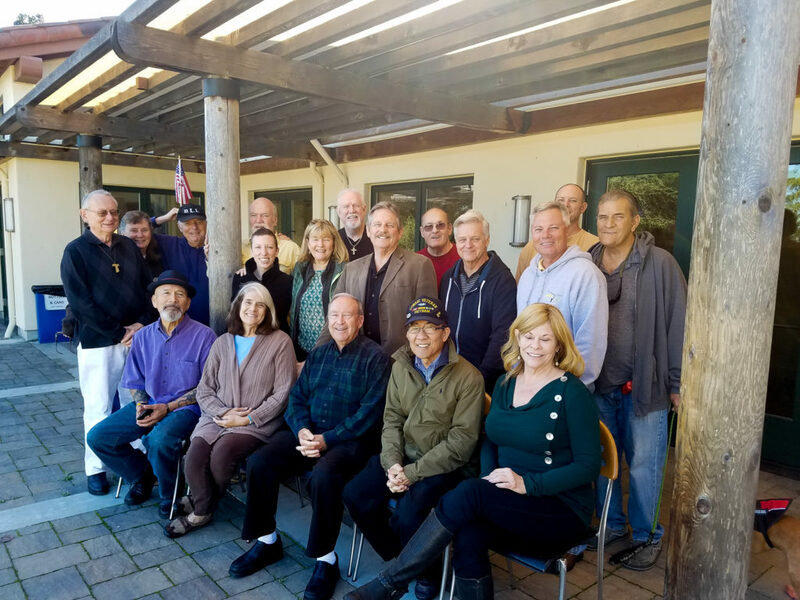 Our November 2018 Healing Journey was a great success. The journey is alway unique, given the great variety of military and civilian experience that gather with us and this was not different. The journey always involves a deep trust and great courage from all the participants. It is always a journey that brings new insights to the team and enable us to create and recreate to make a deeper experience of healing for all. Thank you for the courageous group that participated. Thank you to the donors who made it possible to provide the journey at no cost to all who asked for help. 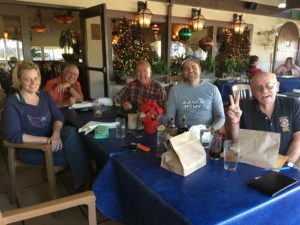 We encourage post retreat contact and the photo is from the Arroyo Grande group Christmas gathering. and our service men and women. Dr. Tick’s books and research on the historical and traditional journey of transition from war and re-entry to civilian life had been ground-breaking and powerful. We owe a great debt of gratitude to them both and wish the the absolute best on their new journey. Godspeed, Ed and Kate! HTRR has been in contact with several groups about partnering our efforts to make our outreach more successful and reduce costs. We will keep you posted on these negotiations as they develop. 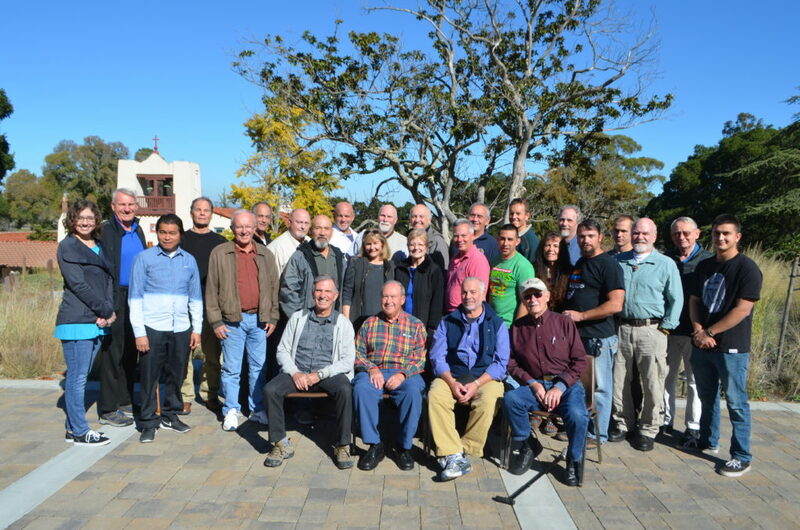 We will not be able to do a November 2019 Retreat. 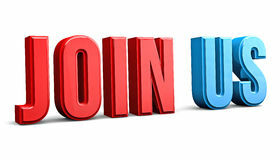 We are intending to schedule for some time in 2020 and are currently creating a list of those who might like to attend. If you are interested or are looking for more information please contact us at elderwarriormjc@gmail.com. Our journey is one in which we listen without judgment, critique, analysis or diagnosis, but only with respect for the storyteller and the story. We are also looking at providing a team for those who may have an appropriate venue and people who can attend. This would be especially helpful if you have a group since it saves travel costs for the group. We have specific venue and group requirements to make the Journey effective. Please contact us at elderwarriormjc@gmail.com or by mail at: HTRR, 1241 Johnson Ave. Suite 307, San Luis Obispo, CA 93401-3306. Not only did veterans experience the healing process, but also civilians. Many of the civilians on this journey were spouses, children or relatives of veterans who sought to understand what their loved ones experienced in war. The healing is in the journey and not complete, but warriors who experience it now have new tools and a supportive community of friends to walk the journey with them. The success of this process has encouraged us to grow and refine the journey. Both St. Francis and Jose suffered PTSD and from the wounds of war. 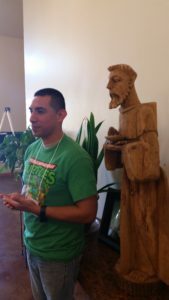 Jose was blessed by the story of Francis and what he did in his recovery. This journey included Active Duty Soldiers as well as Veterans. The latest evidence based research shows that this type of program works very successfully with Active Duty Soldiers. It decreases the levels of PTSD and gives them an additional sense of connection at home that makes them safer and better soldiers. This enables us to expand our program as well as to help our Active Duty Warriors. On this journey we had Veterans from the Korean War to the present. What was different about this journey was the presence of Active Duty Soldiers. One of our VA Therapists pointed out that evidence based research shows that a program such as this eases the PTSD in a soldier and gives them a real sense of connection at home. They prove to be better, safer soldiers in combat situations. The support of Vets who had “been there, done that” was also helpful. 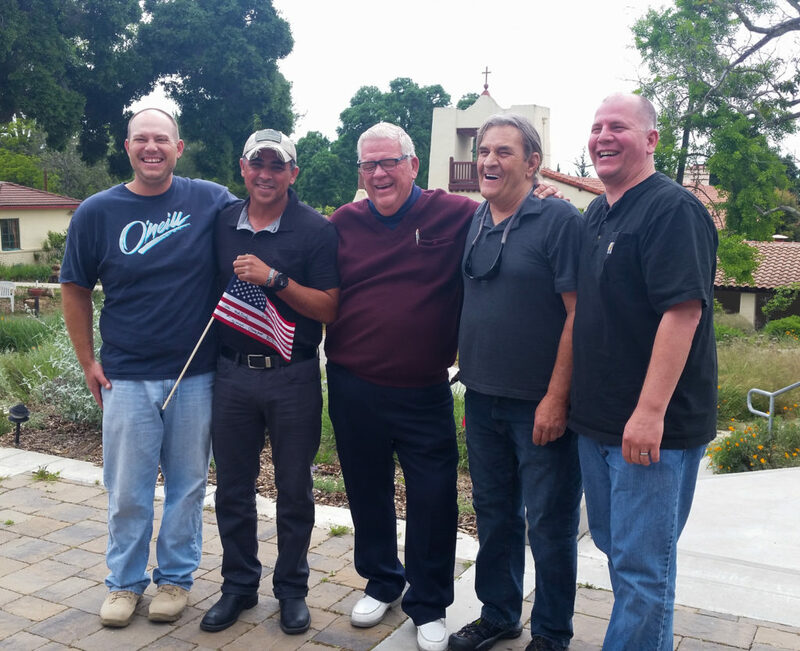 April Journey Home: Our Vets surrounding our Active Duty Soldier holding the flag. Last ceremony felt great – Welcoming Back Ceremony. Connections we made as human beings; vets and civilians. Understanding that civilians are people too. Making friends and renewing friendships. The love and compassion shown by the leadership and constant reassurance of our needs and fears that we are not alone and will not be judged. It is always an incredible honor to be a part of these journeys. Love and trust was shared with all. Reading War and the Soul by Dr. Ed Tick before the journey. Unpacking the Rucksack by the Vets. The vivid wound ritual and owning the wounds as our civilian responsibility – sharing the wounds. Understanding how deployment impacts soldiers and their families. The purpose and mission to hold each other. Learning the perspectives of the veterans.. Feeling that the Veterans and Civilians left with an experience they will share with others who can then better understand the effects of PTSD. We continued to refine the experience and also had a number of returnees. The returnees related to us that they experienced a better sense of healing and a deeper sense of belonging. Receiving a deeper understanding of the civilian side of the relationship. Being able to open up. The incremental approach to the theme and the way that it is woven together. Unpacking the rucksack/telling our stories, sharing our wounds. A gathering of like-minded people. Finding peope whose experience and disillusionment are similar to my own. Being able to talk to other veterans. Being in a circle where I felt calm and relaxed. Down-time for reflection and prayer. Recognition of some issues that I didn’t even realize that I had. I really loved the groups, the interaction was great. 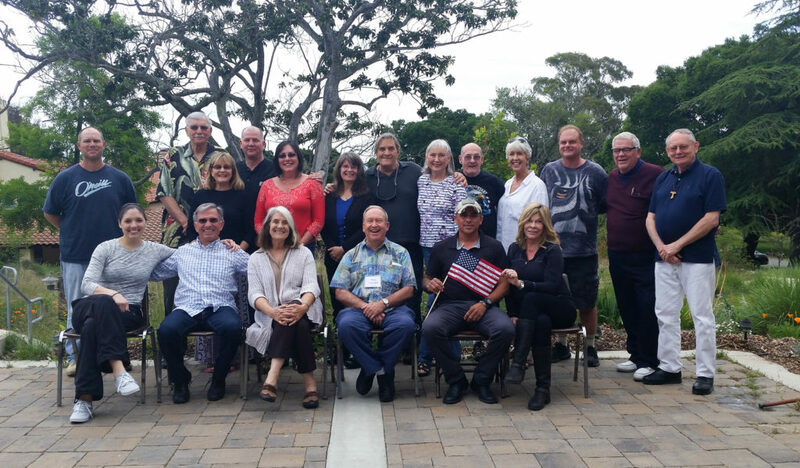 HTRR cohosted a fundraiser, Sunset With a Vet, with Central Coast Veterans Helping Veterans (CCVHV) on Saturday, October 21, 2017. A huge thank you to all who helped support our very successful event. The event featured an afternoon of entertainment on the shore of Shell Beach at the home of Mike McCarthy, one of our sponsors. Our share or the proceeds came to over $10,000.00 and will go to our Healing Journey Program, helping Vets deal with PTSD and other war wounds, and helping civilians own their moral responsibility for our Vets and Active Duty personnel. CCVHV received and equal amount in support of their Veterans Treatment Court Mentor Program and their ongoing support for veterans and their families in crisis. Like the Healing Journey’s of the past, we continue to improve the process and ritual and this year was no exception. Integral in the journey are the tools of ritual and process. This year we had the privilege of having people making the Healing Journey who have particular skills in these areas and to be able to give us more insights and tools for the journey. The “editing” of the program will never end, nor should it. There is always more to be learned. 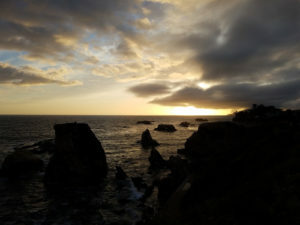 There are many approaches to the healing process for PTSD and we feel we can take pride in what we offer thanks not only to people with healing skills, but especially to our veterans who offer us the best insights into dealing with the wounds of Post Traumatic Soul Distress, Traumatic Brain Injury and Military Sexual Trauma. Special thanks to all of you who have contributed your insights. 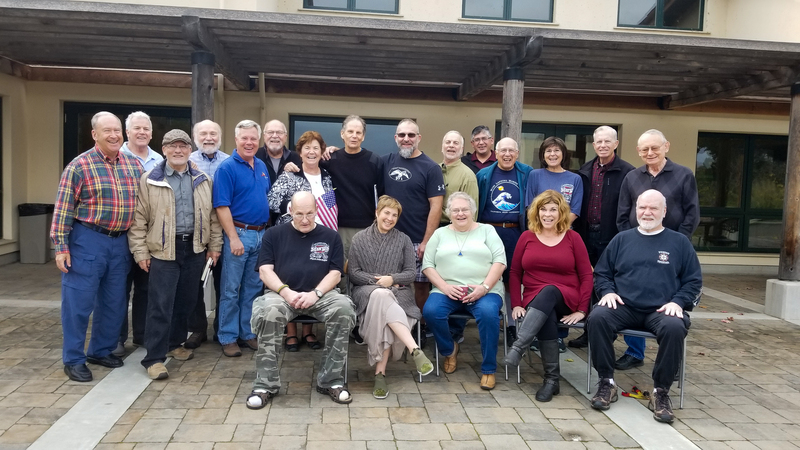 Unique to this Healing Journey: this Healing Journey had more non-combat vets and only a couple on post-Vietnam vets. We went more deeply into the issues of “non-combat guilt” and “survivors guilt.” More vets delved into pre-service issues and as a result there was a deeper connection with civilians and more healing.